Congress General Secretary Priyanka Gandhi on Monday kicked off her three-day Lok Sabha campaign in eastern Uttar Pradesh by taking on Prime Minister Narendra Modi over his “Mai Bhi Chowkidar’ campaign”, claiming that “Chowkidars are for the rich and not the farmers”. 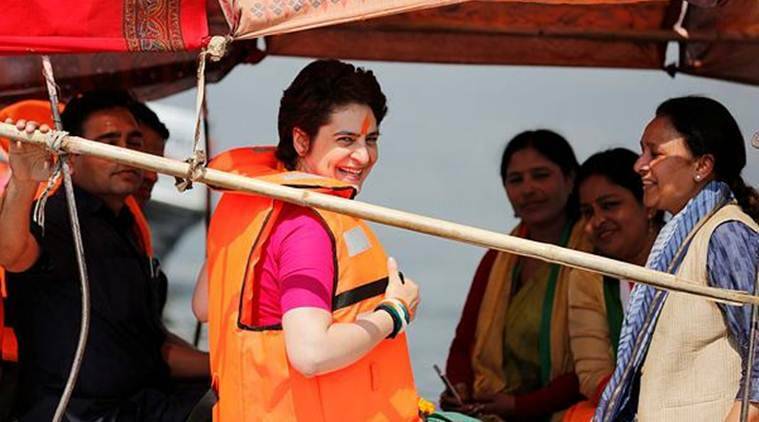 As she began her “Ganga Yatra” on a boat from Manaiya Ghat in Kachnar tehsil of Prayagraj district, the 47-year-old Congress leader interacted with a cross-section of people, including students, and urged them to bring a “government that works for them” and asserted that “my brother Rahul Gandhi does what he says”. “My brother Rahul Gandhi does what he says… in MP, in ten days of Congress coming to power, farmers’ loans were waived…same in Rajasthan,” she told the crowd. 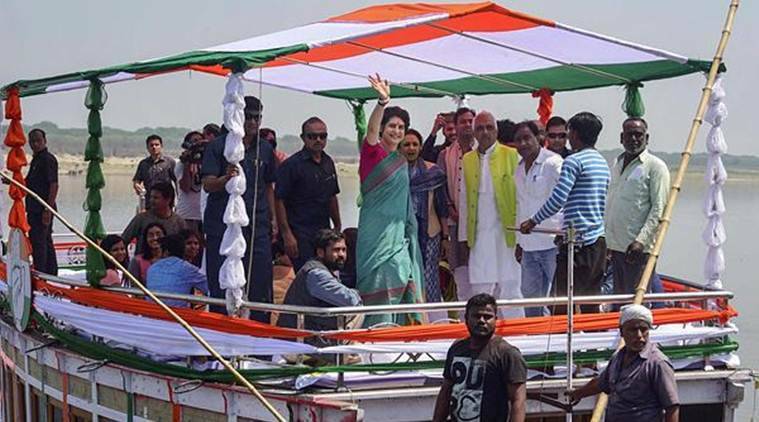 “I want to urge you, my brothers and sisters, to vote wisely in these elections and form a Congress government so that your problems could be looked into…this area has specific problems,” she said, adding that she is aware that sand mining rights are not given to boatmen who are ‘ganga putra’ and added that “Rahul has said that a separate ministry for them will be created”. Raking up the issue of unemployment, Priyanka said that the electorate had witnessed Congress governments during which schemes like MNREGA was launched and regretted that jobs had become scarce in the present times. “Elect a government for yourself as the responsibility of the country is on you… it is because of you that we are standing here,” she said. “When you will strengthen the Congress and Rahul ji, you will see in the times to come that development is taking place,” she said referring to her brother and Congress chief. The Congress leader visited Sangam and offered prayers at the Bade Hanuman Mandir, popular as ‘Letee Hanuman Ji’ near Prayagraj Sangam. She was accompanied by party leaders, including BJP turncoat Savitri Bai Phule and Congress MLA from Rampur Khas (Pratapgarh). Priyanka also made a halt at the Dumduma Ghat. After a night halt in Sitamarhi in Bhadohi district, the Congress leader will resume her onward journey tomorrow morning that will culminate in Varanasi on Wednesday. The Congress leader is expected to cover a distance of 100 km by boat in Ganga from Allahabad to Varanasi, the parliamentary constituency of PM Modi.